Before launching this unique competition I had promised to make the Bird Photo Booth available to the primary sponsors first so they could see their neighbourhood birds and be trendsetters. 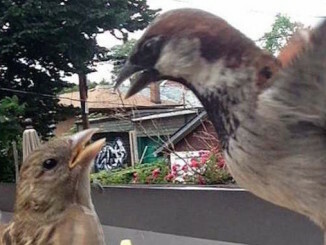 The deal was they could try it first, and get pictures of their birds up close before the rest of the world caught on and wanted to use this thing. 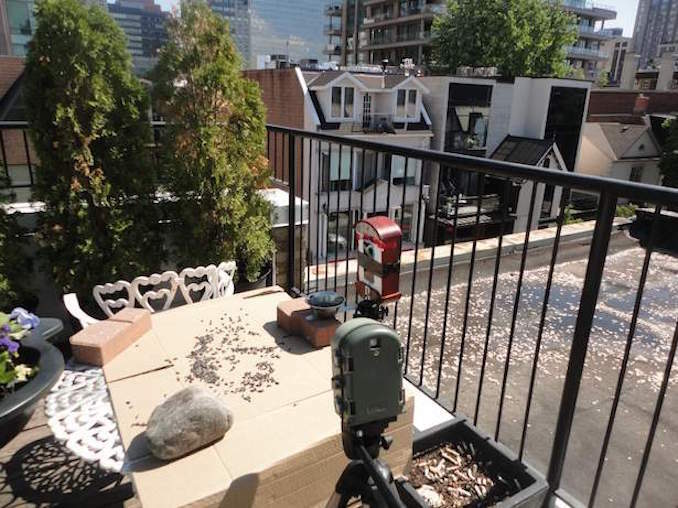 So now in Week Two, the Bird Photo Booth traveled downtown to settle atop Yorkville’s ultra fashionable boutique businesses, and atop the rooftop balcony of some of the most expensive real estate in Canada. 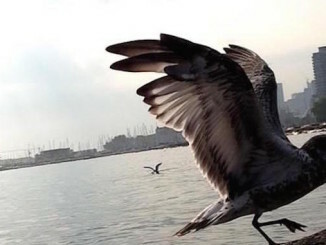 It sat up here to pay homage to a primary sponsor, Vigorate Digital Loyalty Programs, the people who helped build the Birds of Toronto contest website that accommodates the 2014 business challenge, an automated ‘selfie’ bird portrait photography contest. Vigorate Digital is located at 1252 Yonge St on the second floor of a four storey building, and although they have a spacious interior with bright windows (with corporate names and logos stenciled on the glass which makes them quite bird friendly), they don’t have a rooftop patio, or an exterior balcony of any kind, or even any windows that open. So in order to accommodate their contest entry, I had the interesting challenge of finding a neighbouring rooftop balcony location, and did secure a spot just a few streets south and west of their building on Scollard St. Two youthful interns helped me carry everything over and up four flights of stairs at that address. On that fantastic rooftop patio we positioned the cameras in different ways with different backgrounds, and over the course of seven days I learned a lot about shooting birds in this city. It was Day Five before any birds even noticed the birdseed. 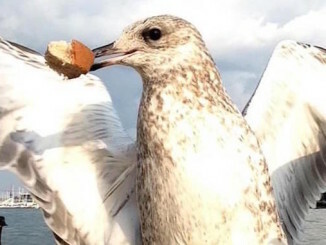 One of the most important lessons that I learned here is that the contest locations should be primed with food prior to the arrival of the photo booth – the avian visitors need to be shown that the booth is not a threat. A silver dish full of free food isn’t something these birds see everyday, and so it takes them by surprise and they need a week to get used to the contraptions; indeed some of the best pictures in the contest so far are of the birds looking puzzled as they get up close to the rig. As humans we wonder what they’re thinking. . . When I showed up on Day Six, I noticed with delight that half the Sunflower seeds in the feeder bowl were missing, but yet still there were no pictures. Finally, on Day Seven, the last day allowed, there were a few blurry pictures on one of the chips. 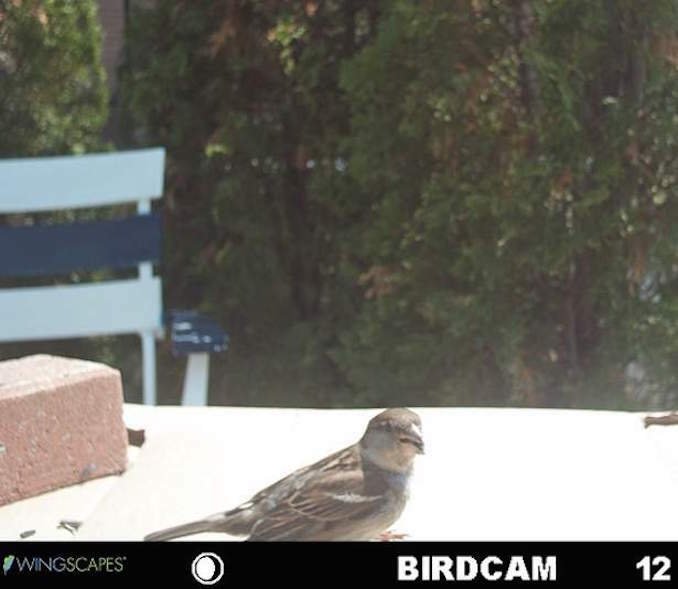 The Wingscapes BirdPro camera had motion detected and photographed a tiny visitor that day, a brave little Field Sparrow. Field Sparrows are found everywhere in downtown Toronto. This is a common bird, and very quiet most of the year, but during its spring mating season it comes alive with a big bouncy ballad. The tiny male Field Sparrows have great big voices when they’re out looking for females on spring mornings. Next week, the Bird Photo booth is off to Standard Telecom, another eager sponsor and challenger.